In Toronto? Win an exotic trip TOMORROW! Creative Commons photo by OliverN5 (Oliver Mallich). 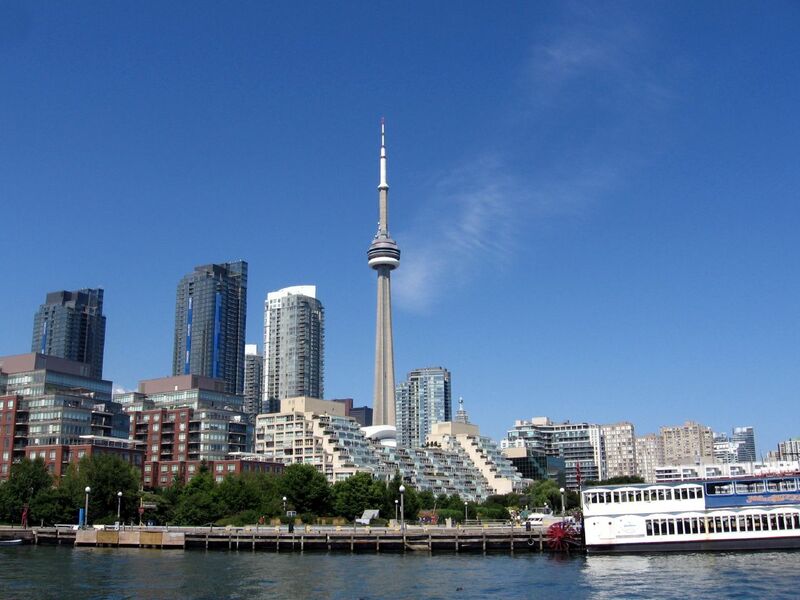 Visiting Toronto for the Toronto International Film Festival? Or do you live in T.O.? Either way, drag yourself away from the movie screens tomorrow and you could win a free trip from Intrepid Travel. Here's the scoop. The Australian-based adventure tour company will be placing a total of eight globes in various Toronto locations on Tuesday. Each globe will have a "boarding pass" attached describing the prize trip (exotic locales include Morocco and Peru). The company is also giving away vouchers worth up to $1,000 toward an Intrepid trip. So how do you find these globes? Follow the company's Twitter feed (@Intrepid_Travel) for clues. The fun starts at 9am on Tuesday, September 14. Curious about Intrepid? 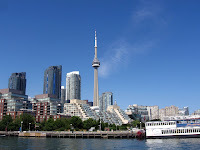 Watch this blog for my post about a fun Toronto walking tour I took with Intrepid's "day trip" company, Urban Adventures. My Multicultural Kensington Market and Chinatown tour included lots of historical tidbits and fun shopping stops. If you've ever thought, "Gee, chocolate bars would be great if they weren't cluttered up with nuts and caramel," then Max Brenner's is the place for you. The Australian chain of chocolate cafes (which also has shops in New York, Philadelphia and several other non-Aussie places) has the genius to serve chocolate in its most unadorned form: the suckao. The suckao costs $6.50 Australian and it's worth every penny. 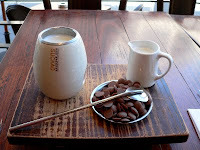 Basically, it's a mug of milk kept warm over a small candle, served with a small dish of high-grade chocolate chips. Stir the chocolate into the milk. Wait for it to melt into a gooey mess reminiscent of the icing you used to lick out of grandma's cake bowl. Inhale through the small metal straw, which doubles as a spoon. Repeat until your head explodes. Feeling guilty about all that sugar and fat? 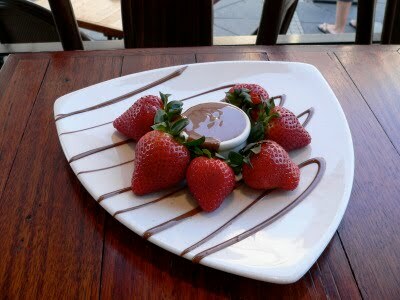 You could always finish your meal with strawberries dipped in, well, chocolate. FacingTheStreet takes no responsibility for your ensuing dental bills or sugar crash. Just enjoy the fun while it lasts. P.S. : If you like reading about food around the world, check out the links posted each week at WanderFood Wednesday! As British writer David Aaronovitch points out in the introduction to his 2000 travel book/memoir, Paddling to Jerusalem, in the last few years writers have walked around England under the guise of just about every gimmick imaginable. From south to north, around the coast, up the middle, round the sides, in wheelchairs, on one leg, carrying heavy electrical goods, with no money, with a dog, with a horse, in the company of Ian Botham, each walk slightly more improbable than the last. He concedes that walking is the right pace for seeing the true England: "It is a micro-country, where everything is in the detail, and any speed of more than 5 mph means that most of what England has to offer must be missed." However, instead of walking, Aaronovitch chooses a similarly slow method of transport when he sets out to travel from London to the north of England in the summer of 1999. He decides to go by kayak. Aaronovitch's accounts of his lack of athletic prowess in training for the trip are hilarious. In fact, I went to the effort of tracking down the one copy of the out-of-print book in the Ottawa Public Library system solely because he gave an hysterical account of his adventures at the keynote address of the Travel Media Association of Canada's annual general meeting last March. And there are laugh-out-loud moments throughout the book, too. Along England's quiet canals and surprisingly challenging rivers, he runs into tattooed anglers and chatty lock keepers, delves into the novels of Georgette Heyer in dusty country inns, and develops a titanic loathing for swans. He's also a self-confessed history nerd, and the book is sprinkled with tales both funny and horrifying about everyone from 12th-century monarch King John to 20th-century prime minister Stanley Baldwin. But at its heart, it's a more reflective book than I was expecting. Aaronovitch sets out on the journey for a few reasons. One of them is his self-proclaimed wish to transform himself from grouchy, stressed "Mr. Stormy" to cheerful, relaxed "Mr. Sunny." Even more than that, though, he is trying to come to terms with the death of his father the previous year. Father and son had a complicated relationship, which Aaronovitch slowly and skilfully reveals to the reader. In the end, the kayaking trip--with its tendonitis, rainstorms and rock-throwing urchins--is just the framework on which Aaronovitch hangs a much more personal tale. He gets to the heart of what makes him tick. In the process, he discovers the soul of his country as well. Middle England is a land of saucy grannies, voyaging landladies...childhood museums, 50s' nostalgia, opticians, aromatherapists, steam railways, scented candles, shopping malls, computers, coffee cake, stress phalli, Man Utd supporters, rock festivals, soap opera behaviour, of young men driving too fast and waterside views...Of Midde Earth, middle management and Middlemarch. A country, for all the public pessimism, surprisingly unafraid about its future. The book will be too introspective for some, too flippant for others, and too full of historical asides for many. While I enjoyed it throughout, it took a long while to really grab me. 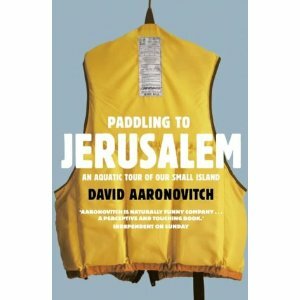 Of necessity, any travel narrative in which most days follow the same pattern--wake up, paddle for four or five hours, negotiate locks and swans, tie up the boat, stay in some form of accommodation, eat a lonely dinner while observing the locals--is in danger of becoming monotonous, and Aaronovitch does fall into this trap a few times. But by the end, as his life story, his kayaking trip and the tale of England itself all came together, I found myself eagerly flipping pages to learn how it would all turn out. The often-windy Iles-de-la-Madeleine in eastern Quebec are a hotbed for the sport of kite-buggying: basically, zipping along the beach in a buggy, powered by a parachute-like kite. The driver holds a set of lines made of super-strong Spectra. A tug on the left turns you left; a tug on the right turns you right. 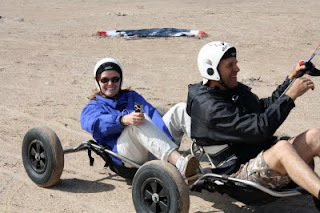 After a quick lesson on kite management from Eric Marchand, a world champion kite surfer and owner of Aerosport, everyone in our group had the chance to sit behind him in a tandem buggy and hurtle across the beach. 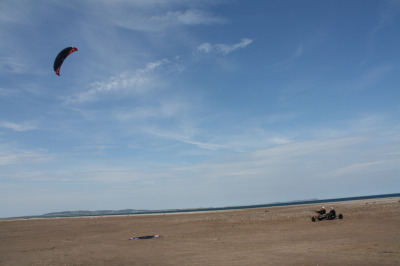 I spent most of my time yelling in glee as sand sprayed in my face, but I survived to tell the tale. Disclosure: I travelled to the Iles-de-la-Madeleine courtesy of Tourisme Quebec. I have a strange fascination for oddball road signs, dating back at least as far as 1978, when my sister and I spotted a British road sign that consisted of nothing but a large exclamation mark and the dire words, "Warning: Road liable to subside." This one was in a shop window, rather than on an actual road, so it is likely just a joke. But I liked the joke anyway. 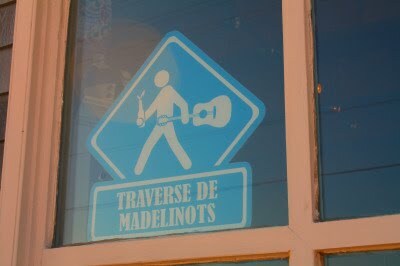 I travelled to the Iles de la Madeleine courtesy of Tourisme Quebec. Warning: Those with squeamish stomachs might wish to skip this post. I'm just saying. 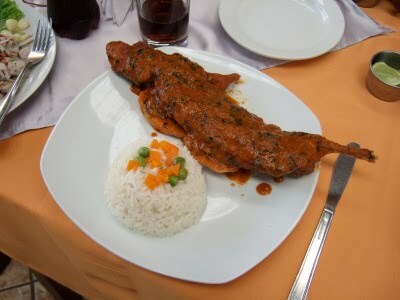 Throughout my week in Peru, one dish popped out on almost every menu: cuy. Come on, coward, it taunted me. You say you like to "live like a local." It's time to eat like one. I do like to live like a local on the road. I'll happily rent an apartment, stumble through an unfamiliar language, wander the back streets of neighbourhoods far off the beaten path. But when it comes to food, I'm as unadventurous as a six-year-old. And cuy--the Peruvian term for guinea pig--definitely challenged my self-imposed boundaries. I told myself I was being a hypocrite. After all, I don't have a problem with eating chicken, lamb, beef or fish. Animals are animals, right? But no matter how I tried to psych myself up, when it came time to order, I'd usually choose something safe, like lomo saltado (stir-fried beef). What finally convinced me was the lure of cold, hard cash. An editor back in Canada had offered to pay me to write a story about cuy. So in a bistro in Huacho, I took a deep breath and ordered cuy. 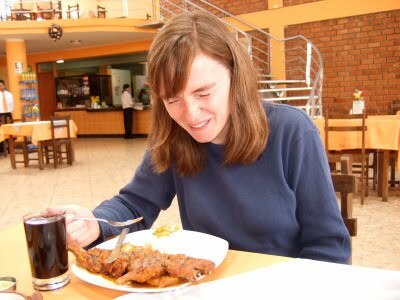 I was so flustered, I forgot to ask how the dish would be served. In the back of my mind, I was thinking everything would be chopped up and slathered in a thick sauce, like some sort of Peruvian take on curry or gumbo. My stomach dropped when my plate arrived. Here's what I saw. It had teeth. It had claws. It looked like a meal that could bite me back. When I finally picked up my fork, I found the meat surprisingly bland, like overcooked pork. That didn't help, though, as you can see from my expression. I managed just three bites before gratefully accepting my companion’s offer to trade lunches. For a less drastic taste of Peru, I’d recommend ceviche (marinated fish) or chicha (a slightly alcoholic beverage made from corn and fruit juice). Save your bravery for the winding, potholed mountain roads, where many drivers think speed limits, signals and lanes are for sissies. P.S. : My Aeroplan Arrival magazine article about cuy isn't available online, but you can read my short guide to Peru for the same magazine. Disclosure: I travelled to Peru courtesy of Peru Tourism.